infinite, 4 second, or 6 second time limit. Each player is dealt 7 cards and they activate the red button that is closest to them. 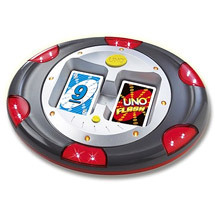 The first difference you between Uno Flash rules and standard Uno rules is the game unit automatically selects a player to start randomly. Play from then on will randomly shuffle to each player. Sometimes, a player will get 2, or 3 turns in a row. After a player plays their card they tap their button to send the turn to the next player. Another difference is there are no “Reverse” cards, and instead there are “Slap cards”. When a player plays a slap card they hit the large yellow button. Then the other players have to hit their own red button. The slowest person will have to draw 2 cards. When a player no longer has any cards and the game ends, he receives points. All opponents cards are given to the winner and points are counted. As with the original game, the first player to 500 points wins the game. In this version of Battleship the players can choose three modes like mission, death-match and free hunt. You can choose which side you want to fight with and the graphics of the game is very realistic. I need instructions for uno flash game? I need step by step instructions for the use of my flash drive.? Help with flashing BIOS instructions! ?